Best Hostel EVER!!!! The staff is super friendly, the location is absolutely gorgeous, the food is incredible and everything is very well priced. 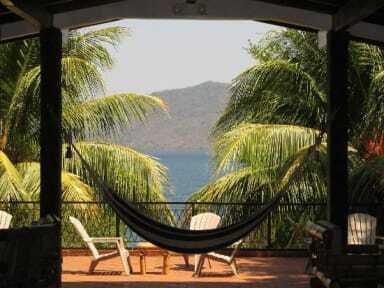 The laguna de Apoyo is the 8th wonder of the world! Lot of facilities and activities: ping pong, pool table, volley ball tournament, TV with champions league :), great vibe, fun people and relaxed atmosphere. The cocktails are made with fresh juices! Wi-Fi is good. Daily shuttle from Granada, you can go to Masaya Volcano from here. Do not miss it! The perfect place to relax. My only suggestion would be to provide 1 fan per bed - or else you may find yourself in a passive aggressive fan battle with your neighbour. Except for the facts that the staff forgot my order and that the prices of the restaurant are a bit more expensive then elsewhere in Nicaragua, the stay there was super nice. I especially liked the trivia night, the bar and beach area, the good atmosphere and the possibility to go kayaking or book tours with them. A perfect spot to chill out! It seems most people just come here for the day, but I highly recommend staying the night. There are lots of tours from the hostel and free kayaks and inner tubes for floating on the water, as well as a floating dock. The food is very good (I don't recommend the pizza though). A little expensive for Nicaragua, but affordable. Perfect for a few days at the lake. Be aware that controlling the bug issues in the dorm rooms in impossible. Be ready to have lots of bugs at night in your room. Beautiful place right on the lake with free kayaks, tubes and lots of nice areas to relax near the water. Although no kitchen and quite expensive restaurant. There is free coffee and cheap water refill though. Lovely location, great food but rather spoilt by rude and uninterested staff. They couldn’t seem to handle day visitors at peak times. Volunteers were nice! 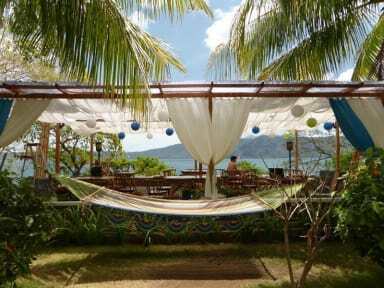 Nice hostel at a beautiful location. Seemed slightly too large to be a very social place, but they put all the newcomers together for welcoming drinks which was a nice way to meet other people! Food was expensive for Nicaraguan standards but very nice and staff was really helpful. Really good place to stay for a night if you want a break from cities.